Cinema Cafe | Theater | Chester, VA - Coming Soon! Virginia Beach, VA---Tuesday, July 17, 2017--- After years without a movie theater, Chester will soon get the best of both dining and entertainment in a unique one-stop experience. 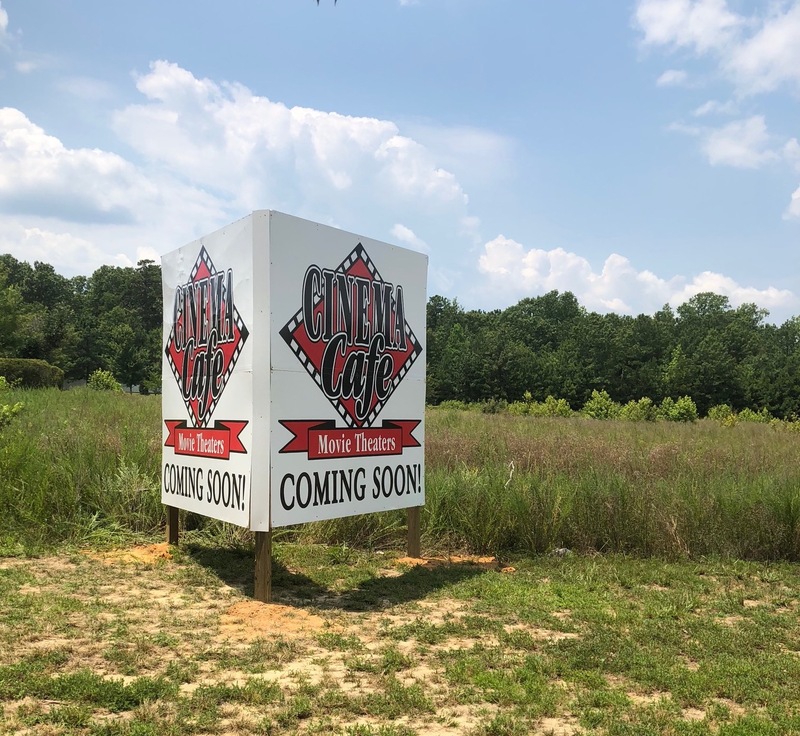 Cinema Cafe is excited to announce its plans to open a new Cinema Cafe location on the outskirts of Richmond, in Chester, VA. The new Cinema Cafe complex, located off Route 301 in the Bermuda Crossroads Shopping Center, is slated to break ground on construction this year for an opening in 2020. “We couldn’t be happier to bring our newest theater to the city of Chester. After visiting the area over the last year, and meeting the friendly people of Chester and Chesterfield County, I know this will be a great match. I’m always a bit nervous about expanding and finding the right location, but with the help of Chesterfield’s Economic Development Department in finding this location, we are looking forward to becoming a member of this community,” said John Walker, CEO. The new Cinema Cafe Chester location will boast nine full service auditoriums with handcrafted American favorites like burgers and pizza; beer, wine and cocktails; and other movie must-haves like popcorn and candy all served at your seat by our friendly waitstaff. Auditoriums will showcase large wall-to-wall digital high definition screens, enhanced Dolby digital sound, luxury leather recliner seating with swivel tables, extra wide space between rows for maximum comfort, and one auditorium with our premier large-format experience, ensuring the high quality viewing experience guests have come to expect from Cinema Cafe. The 45,000 square foot, 1,400-seat nine-plex will be sure to impress former and new Cinema Cafe customers alike. Since 1986, Cinema Cafe is known for being an innovator in the world of dine-in theaters, successfully combining movies and full-service dining into a unique one-stop experience. One of the oldest cinema eatery chains in the nation, locally-owned and operated Cinema Cafe is still winning awards and garnering recognition, like “Best Movie Theater” and “Best Family Entertainment” (The Virginian-Pilot’s Best Of 2018). Guests will be able to order food and drinks from an extensive menu in the theater with a server who waits on them throughout the film with ninja-like stealth. The free-standing establishment will also feature a spacious bar and lounge located in the lobby, which will provide guests an ideal hangout before and after the movie where they can enjoy one of the twenty different beers on tap or a signature cocktail. With a focus on the values of extraordinary service and affordability that helped to establish Cinema Cafe as a staple in the Hampton Roads area, the Chester location will be Cinema Cafe’s sixth location in Virginia and is much larger than the original Virginia Beach twin-plex that John and Debbie Walker opened thirty-two years ago as of May 2018. Cinema Cafe is looking forward to welcoming and serving guests at the Chester location in 2019. For more updates and information on Cinema Cafe Chester, follow us on Social Media.